reigning champion is Max Byrd." 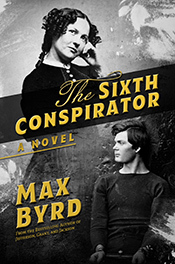 Max's next novel is The Sixth Conspirator, to be published by Permuted Press on August 27th. This is an historical thriller—and love story—centered around the little known American State Department secret mission to Europe in 1867, on the trail of the last of the conspirators who assassinated Abraham Lincoln (all true!). It takes the reader from Washington to Montreal to London, Rome, and finally, climactically to the dangerous, romantic streets of Paris. It is entirely possible that Henry James was in love with Robert Louis Stevenson. Certainly, their long, warm—and unlikely—friendship seems to call for some such explanation: how else could the author of Treasure Island and the author of The Portrait of a Lady have hit it off so well? Great News! All of Max's earlier novels are being reprinted! They're available now in beautiful new paperbacks or in ebook form. The three novels about American presidents are republished by Random House. Each one has a new feature at the back written by Max just for these editions. Very suitable for book clubs and discussion groups. And Max's early detective novels and thrillers have been reissued from Turner Publishing as gorgeous new paperbacks. Historical fictiontelling dramatic stories about real people and events from the pastmay be our oldest literary genre. In the Western tradition, historical fiction probably begins with the Iliad. After that it is a very rich field indeed: Shakespeare wrote history plays, Charles Dickens, Mark Twain, and Nathaniel Hawthorne wrote historical fiction, War and Peace is an epic historical novel. Max Byrd's acclaimed historical novels concern both real and invented characters. The settings are authentic, the story-telling dramatic. The Associated Press says that his novel Grant, about the last years of Ulysses S. Grant, "is typical of what Byrd does so wellcombine a minimum of fictional characters with splendid research, vivid imagination, and above all, historical accuracy to portray a truthful profile of a famous American." Site design © & maintenance by xuni.com. All content © 2009-2019, Max Byrd.